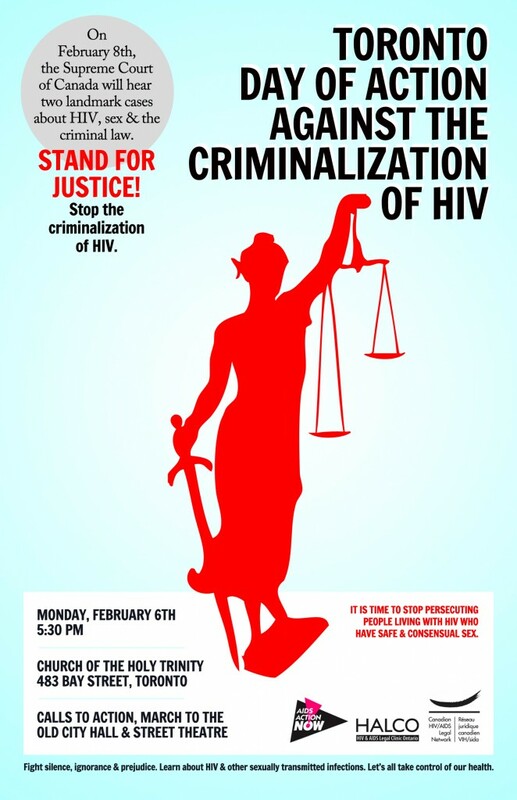 REMINDER: Toronto Day of Action Against the Criminalization of HIV is Monday February 6! – Monday February 6 2012, at 5:30 p.m. The event will include: Calls to Action, March to Old City Hall, and Street Theatre. Fight silence, ignorance & prejudice. Learn about HIV and other sexually transmitted infections. Let us all take control of our health. Visit the AIDS Action Now website for more information about the event: www.aidsactionnow.org . On February 8, 2012, the Supreme Court of Canada will hear two appeals regarding the criminal law obligation of people living with HIV to disclose their HIV status to sexual partners (see our What’s New post for more information). You can find more information about this issue on the Canadian HIV/AIDS Legal Network website: www.aidslaw.ca/site/in-advance-of-landmark-supreme-court-case-supporters-worldwide-call-on-canada-to-stop-criminalizing-people-living-with-hiv/ .